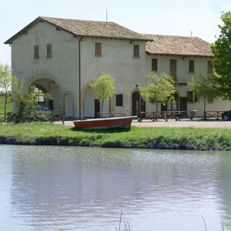 In the locality of Mondonuovo, a farmhouse of the end of 19th century, surrounded by a green area of twelve acres and four lakes that inspired the choice of the name of the place. Traditional cuisine with local, seasonal ingredients, hand-made pasta and desserts. Here you are some past dishes of the menu: "tortellini" (fresh pasta with meat filling), "tortelloni" (fresh pasta with spinach and cheese filling), "lasagne", "tagliatelle al ragù" (noodles with meat sauce). Among the meat dishes: roasted pork, tripe, lamb, mutton. Wines from the labels Tizzano, Vallona, Torricella, Drei Donà, Leone Conti, Concerto. You can also buy directly some agricultural products, such as the green asparagus from Altedo Igp, pears and cherries.